Mitosynth takes the concept of vector synthesis from the past and bring it into the future by placing sounds in a “wave chamber”. Mitosynth takes a simple approach: With a tap, almost any dial can be switched out for a graph with automation controls, including LFOs, 5-stage DADSR envelopes, ingenious noise generator, step sequencer, BPM sync — and MIDI, of course. Plus XY pads for the hands-on approach. And you can combine them. Use one automation to control which (or how much) of two others affect a setting. Many of the automation controls are themselves automatable. You can repeat this, going to deeper levels. LFOception! The flexible FX chain means no messing with complicated routing tables, or stringing cables around until your screen looks like a plate of pasta: Slot the distortion, filter, delay and other effects you want, in the order you want. Simple! Pick from 140 built-in patches — or design your own. Start with additive synthesis, wavetables, or a sophisticated mix. Add rich modulation, effects and filters, controlled by powerful LFOs and beyond. 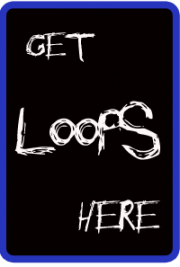 Make vibrant leads, vast soundscapes, compelling basses, warm bath or deep sea pads, and so much more. 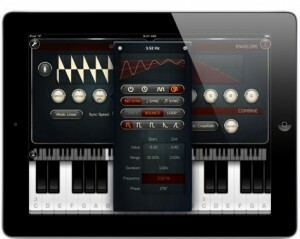 Grain Science is a beautiful new iPad Synthesiser. Designed for musicians, soundscape artists and SFX engineers who want to go beyond our Sylo Synthesiser, Grain Science is built on similar principles of granular synthesis, but is vastly more powerful. 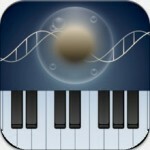 • iPhone and iPod touch support: Grain Science is now a Universal app, one purchase works on all your iOS devices. With Retina graphics for 4/4S and the new iPad! • G-1000 Shapeinator: A new fully customisable wave-shaping FX unit. • New: Tube Resonance Bass can be programmed. Note: It can bite! Slow, gentle programs are recommended, unless you want artefacts! • New: UI improvement — Grain Mode, Blend Mode, Reverb Mode and AGC buttons can now be dragged up/down to quickly change modes without popping open a separate panel. • Fix: Parameters in the control mapping panel now show “FX switched off” when the FX Unit they apply to hasn’t been activated in the FX chain. Use the built-in waveforms, or record or import your own — then use the sophisticated grain engine to create something completely new from them! Grain Science is easy to get to grips with, but offers lots of depth to explore: instead of offering one or two LFOs, almost any parameter in the system can be programmed to vary over time in complex ways. Using new optimisations available in iOS 5, we can provide two grain units per voice, which you can combine for morphing or complex modulated sounds, then send through a configurable FX chain. Pick any 4 from the collection of FX units (including various types of distortion, high- and low-pass filters, phaser, resonance and echo), and connect them up in any order. Other audio tweaks include soft loop, reverb, glide and supercharger controls, and the ability to affect granular synthesis in realtime (live grainbending). Also featured are an arpeggiator with both chord and step-sequence modes; Core MIDI support, including “tap & twist” learning for setting up controls; and a customisable performance screen with a collection of XY Pads and wheels. Rounding it off, Grain Science plays nicely with others: Dropbox, Twitter and email integration are all included, for sharing or exporting your waveforms, recordings of your performances, and instrument (patch) designs.